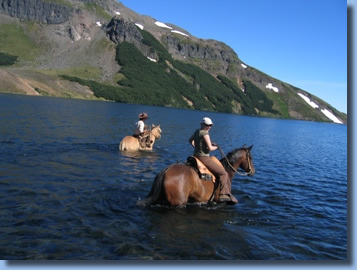 10 day cabin and tent camp based horseback trail ride. 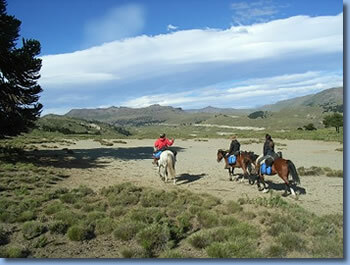 If you’d like to cross the Andes on horseback in more comfort, opt for our cabin to cabin version! 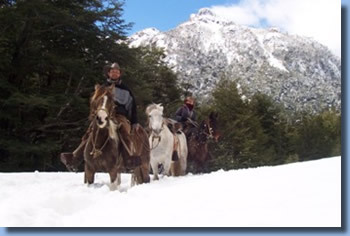 Pack horses and an accompanying 4x4 pick-up truck will carry most of our luggage; more nights are spent in cozy cabins and the "Nevados del Sollipulli mountain lodge" instead of in tent camps; and additional guides help with the tents, the cooking, and the horses. Of course, as on all of our rides, your help is always welcome. Riding without luggage allows us to take a faster pace whenever the terrain permits, and the truck allows us to carry more personal items. 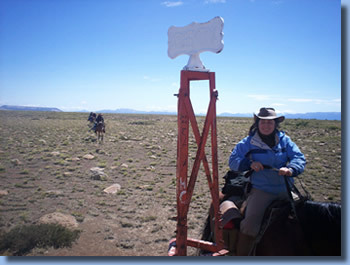 The route is basically the same as on our 9-day trail ride, except that in order to meet the truck and reach the cabins we have to descend into the valleys more often, bringing us into closer contact with civilization. 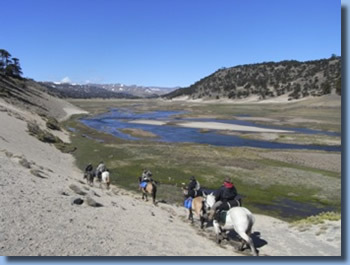 Cross the Andes on horseback with us and get the best of two worlds and two historic horse cultures! 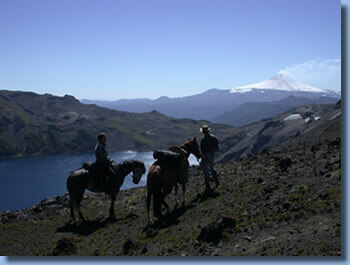 We go for a day ride through the Mapuche Indian Community Quelhue, into the mountains of the Villarrica Forest reserve, and along the rapids of Trancura River to evaluate your riding experience, get familiar with saddle and tack, and to determine which horses to take to our great adventure. In the evening we enjoy a Chilean BBQ. we ride through virgin rainforests and dense stands of Coighue trees and bamboo, and pass by crystal mountain lakes and gurgling creeks. 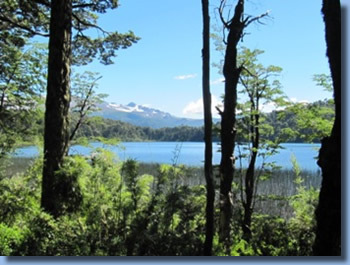 The trails lead through the National Park Huerquehue, the National Forest Reserve Villarrica and the Mapuche Indian Communities of Reigolil and Icalma. Overnights at the natural Hot springs of Rio Blanco and on the shore of Icalma Lake. 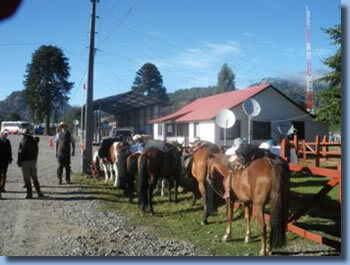 On the 7th day we return to civilization again and ride through the small Mapuche settlement of Icalma where we arrange custom formalities with the Chilean border control before heading into the mountains to cross the border to Argentina. High in the mountains at the border we say goodbye to our Chilean horses and the guides that led us to this magnificent place. Then we cross the border 10 meters on foot, and greet Hernan and his wonderful Argentinean horses which will bring us through the unique world of the Argentinean Andes for the next two days. We ride the valleys and cliffs of Argentina, watch condors pass us by, meet shepherds with their herds of cattle or goats and enjoy amazing views over the endless wide open spaces of this uninhabited part of the world. On the evening of the 8th day we reach the outpost were Hernan lives with his horses and which marks the end of our journey. We celebrate the end of the trek with a typical Argentinean barbecue while recounting our adventures from the past week and sharing our impressions of this experience of a lifetime. On the 9th day we take a farewell ride to the condor nests in the steep rocks north of the camp, and through the high plain pastures where the gauchos graze their herds of sheep and goats in the summer months. 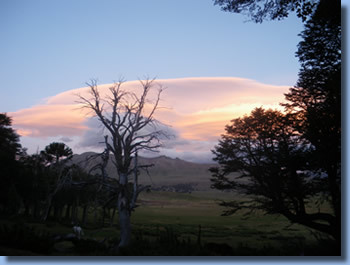 6 nights in double rooms in cabins on the the last days in Chile in Argentina , 2 nights in tent camps. In the tent camps 2 riders share one tent. We always try to give solo travelers a single tent. Because of weight issues this may not always be possible. Shower, tab water, and toilet on all days but 4th and 7th day. Complete food and soft drinks from dinner on the first day to the farewell BBQ on the last day. On the trail we have breakfast, a snack at midday and dinner at the campfire. We serve wonderful Chilean and Argentinean wines for dinner. Here is a suggestion of things to bring to the ride. The luggage you bring on the ride should fit our waterproof pack roll of 20x12x12 inches.